The region has entered its 30th year of discussion about funding Metro. 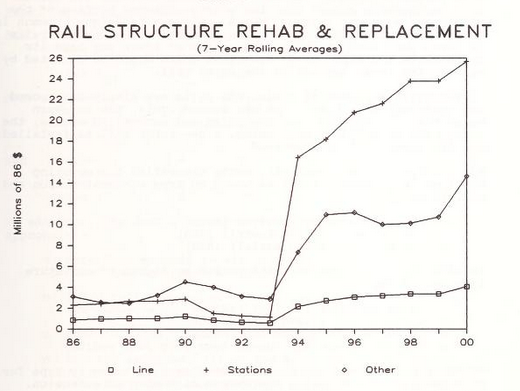 Projected rail structure maintenance costs from the 1986 FCC study. There has been a lot of talk recently and even more sound bites about the need for more consistent, reliable, and dedicated funding for Metro. But while it may seem like an innovative topic, discussions about Metro’s funding challenges and the need for a dedicated funding stream for Metro have been going on for … decades. This has been an identified problem and heavily-studied topic since at least 1986 – the year the Oprah Winfrey Show debuted, Top Gun was the highest grossing film, and Ferris Bueller took a day off. Truth be told, scores of very smart people have expended time and effort and resources to articulate the problems, accurately predict the consequences of inaction, and suggest solutions suitable (and necessary) for implementation. So when you read “news” about Metro’s funding challenges, the problems it creates, and potential fixes – remember that what you are reading is hardly “new”. And no refrain is older than the “it’s not the right time”, to which we must remind the reader that for three decades, it hasn’t been “the right time”. How’s that working out, anyway? In 2005, the Metropolitan Washington Council of Governments, Federal City Council, and Greater Washington Board of Trade published the findings of the Metro Funding Panel, which recommended a Compact-wide increase in the sales tax of one half of one percent (0.50%). In 2006, Metro’s 30th anniversary, the federal government followed the trend and commissioned a study by the General Accountability Office to understand the issues with providing a dedicated funding sources locally. 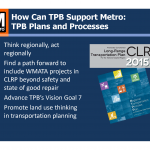 In 2016, Metro’s 40th anniversary, the Metropolitan Washington Council of Governments (COG) and the Greater Washington Board of Trade (BOT) convene a set of meetings (“summits”) to discuss the future of Metro with a major focus on governance and funding. In its efforts to make Metro safer and more reliable, Metro puts the customer first. 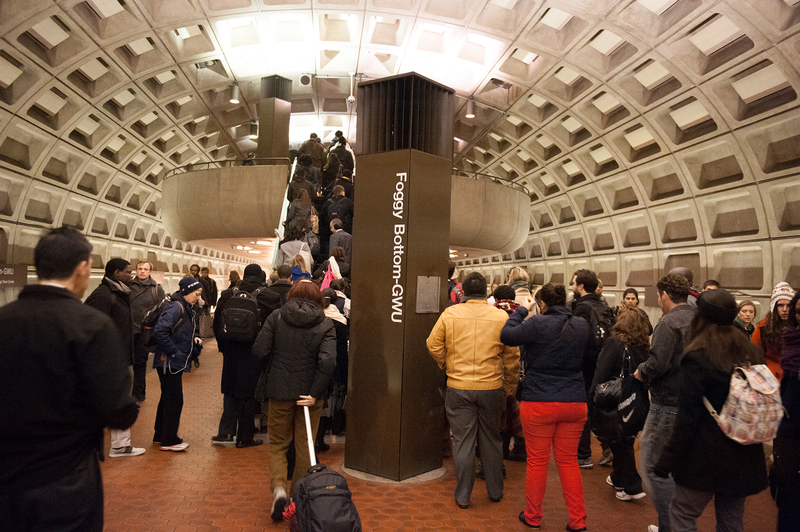 Addressing capacity constraints in our stations, such as Foggy Bottom shown here will provide a safer and more reliable trip for Metro customers. Image source: WMATA. The last year, implementation of Momentum, the WMATA strategic plan, was paused to permit a laser focus on all things safety and reliability. Safety and reliability are what our customers deserve and what they are asking for. Here’s how we pledge to address these critical issues at Metro within the context of putting customers first. Engage our customers. And listen. Metro’s new General Manager and CEO, Paul J. Wiedefeld has dedicated a great deal of time since he came aboard talking with and listening to his constituents. He did this because he knows that to get their support he has to listen to their concerns and ideas for our system and services. 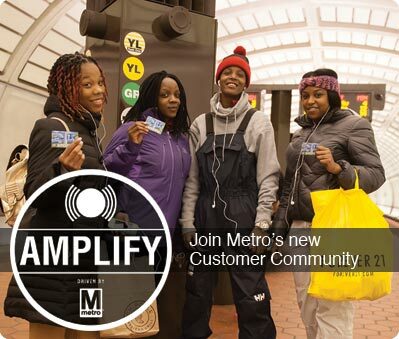 Metro has the tools in place to regularly engage their customers, starting with the American Planning Association-award-winning Public Participation Plan (PDF) but also including a newly formed customer community, Amplify, available for online conversation on a wide variety of topics and initiatives. Let’s follow the lead of the new GM and engage our customers in dialogue on addressing today’s problems as well as rebuilding Metro for the future. The Federal Government is the region’s single largest employer, and where it chooses to locate its jobs has huge implications for ridership, revenue, and the local operating subsidy. We recently detailed why the Federal government’s location decisions matter so much to Metro – and you, the taxpayers who help support WMATA through your local taxes. We’re always keeping an eye on moves within the region and certainly hopeful that any major moves (whether they are in the public sector or private sector) locate near Metrorail. That’s because locating near Metrorail increases ridership, increases farebox revenue, and lowers the (your) taxpayer burden to support Metro. Naturally, the news about GSA’s upcoming decision on the location of the US Citizenship and Immigration Services complex (USCIS) caught our eye and wonkiness. We wanted to know about how much ridership and revenue the different options might generate. A large majority of trips on Metrorail cross jurisdictional boundaries, illustrating that Metro is indeed a regional service. We’ve mentioned before how the station improvements in Metro 2025 will benefit riders from all jurisdictions. 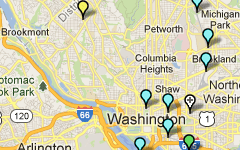 In fact, Dupont Circle is the only station identified in Metro 2025 with a majority of users living in DC. We thought we’d take another look at ridership that crosses jurisdictional boundaries. The table below illustrates the percent of trips, by jurisdiction of origin, that cross into another jurisdiction on Metrorail, sliced by Weekday AM Peak, Weekday PM Peak and Weekend. Data is from October 2014 and includes the new Silver Line stations.